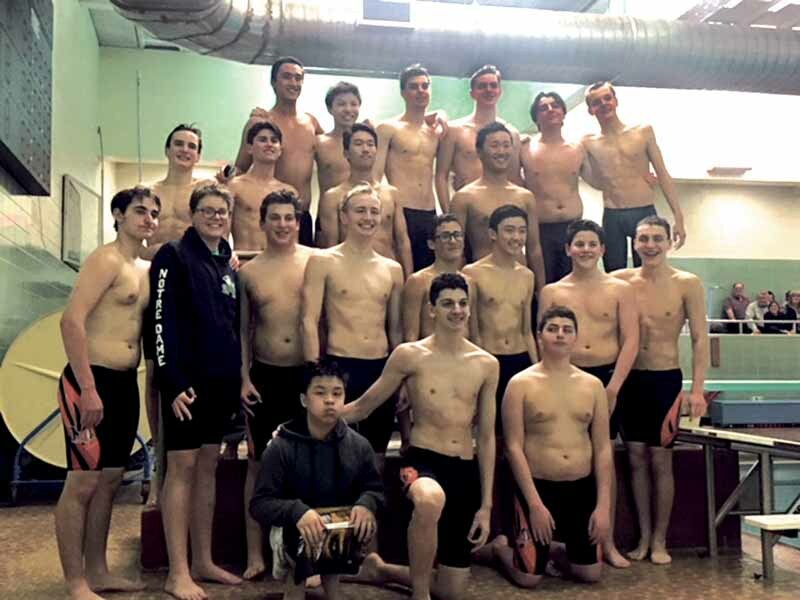 History was made again on Friday, Jan. 26, as the boys varsity swim team defeated Conference One rival, five-time defending overall Nassau County Champion, Garden City. 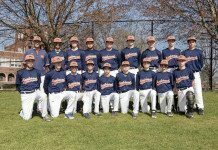 That night, the Manhasset Indians also recognized outgoing seniors Paul Petrakis, Brad Phelps, Kyle Harragan, and Zach Leng. 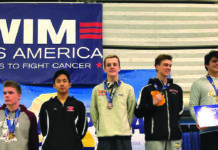 In order to win the meet, a total team effort was required against a championship-tested Garden City team which includes several of the top swimmers and divers in Nassau. The MHS team had to be patient, resilient, and utilize their team depth to outscore their opponent. The Indians got off to a fast start by placing first and third in the Medley Relay, first, third and fourth in the 200yd Freestyle; and first, second, fourth in the 200yd Individual Medley. After three events, Manhasset led Garden City 33-13. As the meet progressed, the Trojans rallied to cut into the lead and then the Indians countered, keeping control. At the conclusion of the meet, the crowd went wild as Manhasset was declared the winner. This is only the second time in the past 25 years that the Manhasset Boys Swim team has defeated Garden City. Go Set! The previous week, the boys had two extremely competitive meets against conference opponents Bellmore-Merrick and Plainview. The Indians were victorious against Bellmore-Merrick but lost to Plainview in the last relay of the meet. Although the 3-5 record may not reflect the incredible record the boys have,they are exceptionally competitive, swimming in Nassau’s top ability-based conference. This is the sixth consecutive season the boys have competed in Nassau’s top conference, which is another milestone for Manhasset High School’s boys swimming program. Highlights from the season include several new school records and two NY State Qualifiers. Senior Zach Leng qualified for the NYS Championships in the 50yd Freestyle, 100yd Freestyle, 100yd Butterfly and 100yd Backstroke. Leng also set school records in all four events. Junior Thomas Broderick qualified for the NYS Championships in the 100yd Backstroke and set a new school record in the 200yd Individual Medley. Additional highlights included many season best and personal best times: Senior Kyle Harragan swam a 24.78 in the 50yd Freestyle and scored 166.42 points in 1m diving. Brad Phelps swam a 27.19 in the 50yd Freestyle and a 1:02.87 in the 100yd Freestyle. Paul Petrakis scored 171.60 points in 1m diving. Junior Matt Kang swam a 1:57.91 in the 200yd Freestyle and a 52.44 in the 100yd Freestyle. Luca Sodi swam a 59.83 in the 100yd Butterfly and a 1:01.30 in the 100yd Backstroke. Mike Brown swam a 25.14 in the 50yd Freestyle and a 1:05.71 in the 100yd Butterfly. Demetrius McNulty swam a 1:08.30 in the 100yd Freestyle. Andrew Comerford swam a 32.96 in the 50yd Free. Sophomore AJ DePhillips swam a 2:08.60 in the 200yd IM and a 5:13.21 in the 500yd Freestyle. Harrison Chin swam a 57.95 in the 100yd Freestyle and a 1:03.00 in the 100yd Backstroke. Andrew Li swam a 1:01.00 in the 100yd Freestyle and a 1:10.30 in the 100yd Breaststroke. Peter Petrakis scored 179.70 points in 1m diving. Jayden Alzate swam a 59.63 in the 100yd Freestyle and a 1:14.92 in the 100yd Breaststroke. Matt Viola swam a 1:17.83 in the 100yd Breaststroke. Andrew Morrissey swam a 1:16.16 in the 100yd Freestyle. Freshman Nicolas Sodi swam a 2:23.66 in the 200yd IM and a 1:05.45 in the 100yd Backstroke. Max Craven swam a 1:06.65 in the 100yd Butterfly and a 59.83 in the 100yd Freestyle. Kendrick Luo swam a 31.60 in the 50yd Freestyle and a 7:16.46 in the 500yd Freestyle. Eighth grader Matt Giardinelli swam a 1:58.96 in the 200yd Freestyle and a 5:20.25 in the 500yd Freestyle.